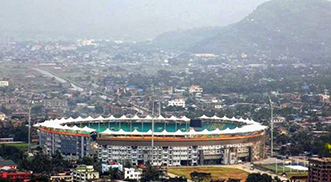 The foundation stone of the stadium was laid by then Chief Minister Tarun Gogoi in June 2004 and he again laid the foundation stone of the club house and stand of the stadium in July 2007 in the presence of then BCCI secretary Niranjan Shah. An area of 59 bighas of land was allotted to the Assam Cricket Association by the State Government and after clearing a portion from encroachers, Assam Cricket Association started construction in the year 2006. On November 4, 2012, the East Zone Senior Women's Interstate One-day Championship match between Assam and Odisha became the first match to be played at the ground. In the 2013-14 Ranji Trophy season, the ground hosted four matches. Assam against Kerala was the first first-class match. The 40,000-capacity, ACA stadium Barsapara,Guwahati is one of the finest in the country having all the modern facilities. Besides the cricketing arena with covered seating all around, the stadium also have necessary infrastructure such as indoor practice wicket,gym etc.Two of the four grandstands,including the players pavilion and the state-of-the-art media centre,the ground's 24-hour water sprinkling facility is also ready. Klorophyll (India) Sports Turf Technology & Construction Private Limited has constructed the main field covering approximately 16800 sq. m., which is first of its kind in the entire country, as it is 100% sand based USGA perched water table profile installed with a detailed subsoil drainage network on grid pattern. The region is subject to very heavy precipitation, so the subsoil drainage system is designed to withstand cloudburst, such that play can start within minutes of a rain stoppage. Further to this the field is irrigated with low voltage automatic satellite controlled pressurised pop up irrigation system having 82 numbers of sprinkler heads and 6 numbers of Quick Coupling Valves necessary for hand watering the wicket square, etc. The main field has eight pitches on the wicket square, and there are ten pitches on a separate practice wicket area covering more than 2000 sq. m. The curators of those are Mr.Mukut Kalita and assisted by Mr.Barsamangal Barooah. © Copyright by Assam Cricket Association All rights reserved.